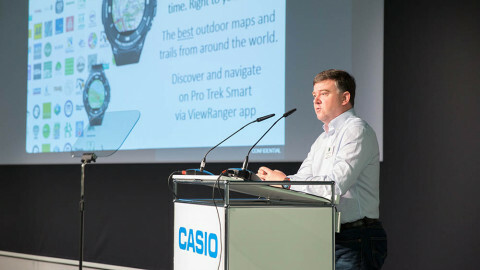 ViewRanger joined Casio at a press conference to launch a new addition to Casio's PRO TREK series of rugged outdoor smartwatches. The event was held on August 30th in Berlin, Germany at IFA 2018, one of the largest trade shows for consumer electronics and home appliances. ViewRanger co-founder and CEO Craig Wareham joined Casio executives and a Google Wear OS engineering director on-stage to present the new WSD-F30 smartwatch. The new model features a thinner profile, longer battery life, and enhanced display. The watch is scheduled for release in early 2019. “More than 2,000 brands and organizations are publishing informative trail guides through the ViewRanger platform and we are partnered with more than 50 national map agencies and map publishers. 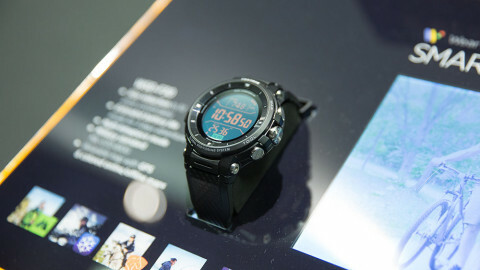 All of this amazing content is available to put onto the Casio PRO TREK smartwatch," Wareham said at the press event. “We’re now working to enable hyper-local discovery of trails so that when you arrive at a campsite, nature reserve, or trailhead, your watch can suggest to you the trails at that location that match what the ViewRanger app has learnt about your outdoor activities. “This is to ensure they are relevant to you whether you prefer family friendly trails or something more challenging. We’re working to deliver the right guide, at the right time -- right to your wrist,” Wareham added. ViewRanger has worked with Casio since 2016 and is part of its worldwide app alliance, a select group of app developers in the outdoor and fitness markets. ViewRanger also won the Android Excellence Award last January, Google Play's top honor for mobile apps. The WSD-F30 features a new and improved dual-layer monochrome and color display. The new color display employs an OLED that shows maps and data in finer detail. The layout of the monochrome display now shows more than just the time; it also displays atmospheric pressure/altitude and compass bearing, as befits the PRO TREK outdoor gear brand. The wrist device also comes with Multi Timepiece Mode, an evolution of the popular Timepiece Mode that allows only time data to be shown in monochrome while toggling off smartphone communication and the color display. In addition to the time, Multi Timepiece Mode now shows measurement data such as altitude and atmospheric pressure in monochrome, while still extending battery life without a charge to about a month, like its predecessor. This feature provides useful information for outdoor activities at a glance while conserving energy.